PAYMENT METHODS: You can use a Visa or Mastercard credit or debit card, or PayPal. If you want to use Pay Pal, click here for instructions before placing your order. Sorry, no AMEX cards. 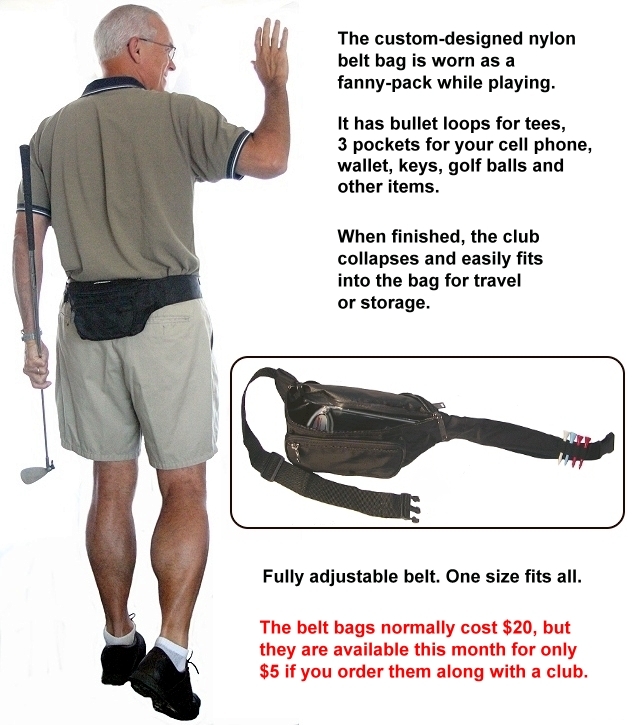 Custom Fanny Pack Bags are included FREE with the Adjustable golf clubs. If you need an extra bag or a replacement, they are $20. The black nylon golf bags have three zippered compartments which hold several balls, your wallet and keys, and all the other things you like to carry! Click here to see how the bag is worn as a fanny pack while playing. When play is over, the telescopic Whole-In-One Adjustable Club is collapsed and fits completely into the bag for storage. One size fits all. INTERNATIONAL CUSTOMERS: If you are outside the USA, shipping rates will not be available using the rate-finder or during checkout. We will quickly get shipping quotes from multiple sources, and email them to you. We will NOT process your credit card until you reply with your shipping choice. Alternatively, you can send an email to sales@divnick.com with your full shipping address and the product(s) you want to purchase, and we will reply with shipping options before you submit your order here. After you have ordered the items you want, click the black Cart box in the upper right corner, then the word "Checkout" and follow the prompts. If you have any special instructions for us, please type them here. How did you hear about our products? OHIO RESIDENTS ONLY - We will add sales tax before processing your credit card.